Posted on April 18th, 2018. Filed under: General News, Room One Articles, Room One News, Room Two Articles, Room Two News. Baking with children may sound daunting – but it can be enjoyable and rewarding for everyone! If you take the time to set up your baking space prior to inviting your child to join in (ingredients, tools, etc), you too will experience the benefits alongside your child. When you think of baking, patience calmness aren’t always the first things that come to mind, but we believe that they are great lessons in baking with children. Firstly, in order to have a good experience, the adult must be calm and patient, and the child(ren) will follow. 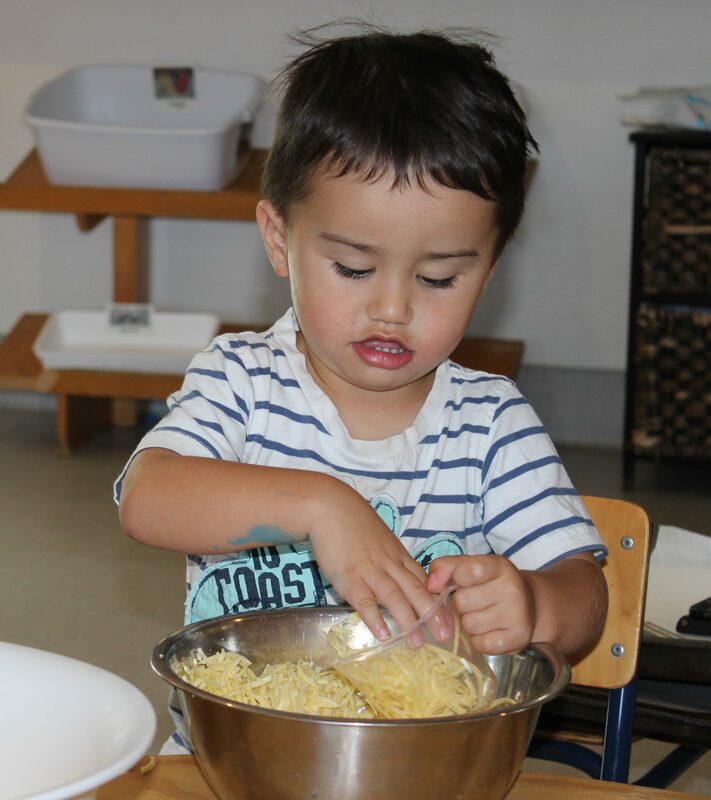 In an ECE setting, the children need to wait their turn to add an ingredient or stir things together, so they begin practicing patience right from the start. Waiting for the food to bake in the oven is another practice of patience. Some foods take up to an hour in the oven, but children will learn that by waiting, there is a tasty reward at the end! Patience and calmness will translate into other areas of your child’s day, and they will learn that being calm during a process actually makes it more enjoyable. Hand-eye coordination is needed when pouring ingredients into measuring cups, and into the larger bowls. 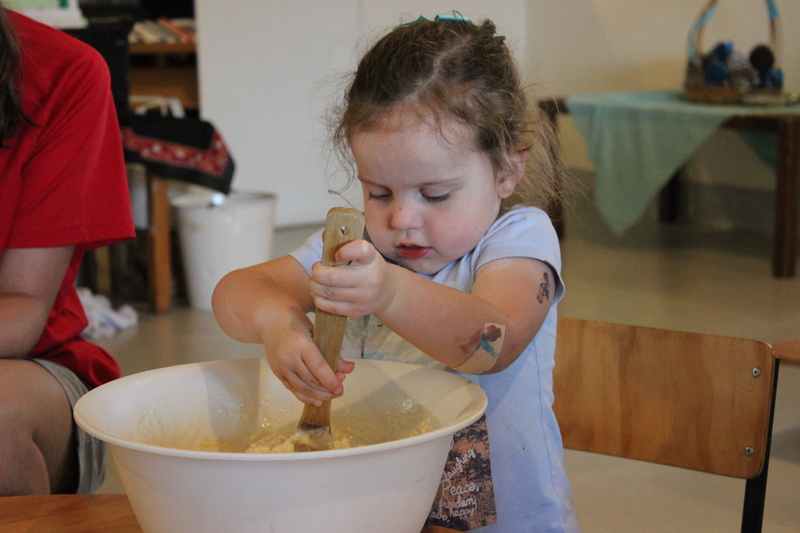 Children will strengthen their grip as they hold and manoeuvre different baking tools. And kneading and squeezing doughs will strengthen muscles in their hands and fingers. Baking is chemistry! The mixing of different ingredients bring about chemical, textural and taste changes in the food as you add them to the heat of the oven. Exposing children to these science concepts at an early age will get them excited about experimenting and problem solving in many areas of their lives. The article Teaching Science and Math Through Cooking explains it further. In following a recipe, children learn to recognize numbers and what they represent. Some of our children are too young to follow the recipe on their own, but we make sure to verbalize what we are doing (e.g. “1/2 a cup of flour, 2 teaspoons of baking powder”). It is more fun for children to learn about the concepts of volume and measurements through practical application. Baking is a great life skill to obtain, and if children have the opportunity to practice it in a fun way, starting at an early age, the self-care aspect of it will be second to the enjoyment of it. It can lead into an interest in cooking, and into young adulthood, your child will feel comfortable and confident in the kitchen (and may even want to cook you dinners!) Also, it is a great time during food preparation to nutrition and healthy eating options. Last, but most certainly not least, baking is fun! Getting messy with ingredients and batters, watching the changes through the oven light, getting sudsy and warm water to do the dishes, and of course, tasting your treats at the end, all make for a wonderful experience. It can be as long or as short of an experience as you make it, but it is quality time with the child, spent learning and growing together.